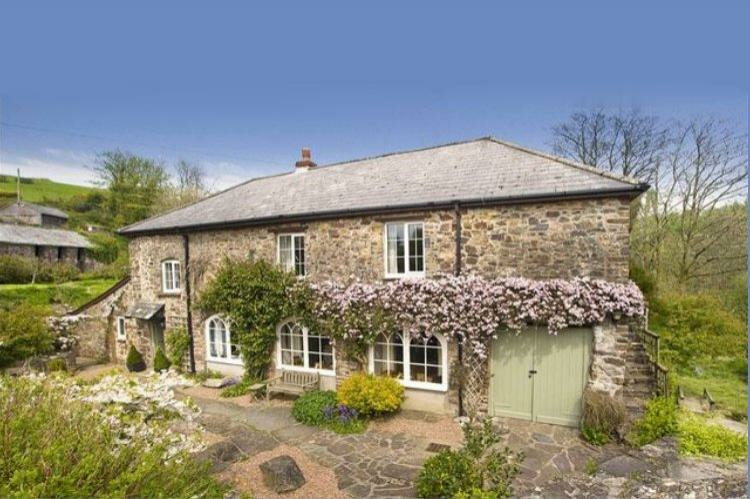 The Mill House at Heasley Mill (Devon) is is a pretty cottage with three arched windows along the front façade which add to the charm and beauty of the property. It's deceptively spacious, with three bedrooms upstairs and ample living space downstairs. The cottage sleeps up to 6 guests. Enclosed patio area to the front of the property ideal for children and dogs. Bed linen and towels are provided but NOT bedding for cot. WIFI,  heating and electricity included. The ground floor of the property comprises the kitchen, dining room and sitting room, all three overlook the enclosed patio area to the front of the cottage. The traditionally narrow staircase leads up from the dining area to the first floor where there are three bedrooms (one with en-suite) and the family bathroom. A security deposit of £100 is required when booking this property. This will be added to the total price of your booking and will be refunded after your stay unless the owner discovers damage to the property or its contents after your departure. Dogs are welcome by prior arrangement (maximum of 2). Please do not allow your dogs on the furniture or upstairs and do not leave them alone in the property at any time. We do not charge for dogs, they are very welcome! You are of course liable for any canine damage and you are expected to leave the property canine evidence-free inside and out. The kitchen is well-equipped and includes a traditional Aga which really adds to the character of the cottage (ever tried aga toast? It's very good!). There is also an efficient combi-microwave oven, fridge/freezer and slimline dishwasher. The pantry off the kitchen provides ample space for your supplies. Other kitchen equipment includes toaster, kettle, a selection of cookware and kitchen utensils plus crockery, glasses and cutlery. The television is situated in the sitting room and is discreetly placed inside a TV cupboard. An iron, ironing board and hairdryer are all provided. Electricity and heating costs are included in the price of your accommodation. The central heating which will be programmed for you yet can be adjusted to suit your preferences. Some logs, kindling and fire-lighters will be provided for the wood-burner in the cooler months, to get you started. Further logs can be purchased locally if required. Bed linen, duvets, pillows bath mats, towels and tea towels are provided , but please bring your own bedding for the cot and also outdoor/beach towels. Starter tea, coffee and sugar will be provided. There may also be other non-perishable items like salt, pepper and oil available. Household sundries such as starter toilet rolls, washing-up liquid dishwasher tablets will also be provided. Please note, there is limited mobile phone reception throughout the village, but WIFI is available in the property at no extra cost. To the front of the property is a lovely patio/courtyard area, which is enclosed (fenced and gated). There is a lawned garden to the side and rear of the house, with great rural views,  which is not totally enclosed so dogs and children must be supervised please. Outdoor dining furniture and a BBQ are also provided. There is off-road parking space for one vehicle. There is plenty of further free roadside parking in Heasley Mill if required. Healey Mill is a picturesque Devon village in a tranquil setting within the Exmoor National Park. The village is just 1.5 miles from North Molton which includes a village shop, church and two pubs. South Molton is 5 miles away and is an interesting and lively country town, there ...is a local market on Thursdays and a farmers market on Saturdays. Barnstaple is the regional centre for North Devon offers a more comprehensive selection of commercial, retail and leisure facilities, the famous Pannier Market and Butchers Row is worth a visit– excellent for both meat and locally caught fish. Exmoor provides a great base for walking, cycling and exploring. There are also opportunities to ride, to play golf at the famous Saunton Sands Golf Course or to visit a number of outstanding gardens such as those at Marwood and RHS Rosemoor. It is also the place for anyone who just wants to relax and enjoy the peace and tranquillity of the North Devon countryside. Heasley Mill is within easy reach of Tarr Steps, The Chains - a wonderful place for the experienced walker, the Tarka Trail, the North Devon coastal path, Woody Bay and the Valley of the Rocks as well as Lynton and Lynmouth. The beaches at Saunton and Croyde are not far away. Full arrival information will be provided once your booking is paid for in full. This place would love your review!